July 8, 2017. This was a family outing with kids, aged between 5 and 11. 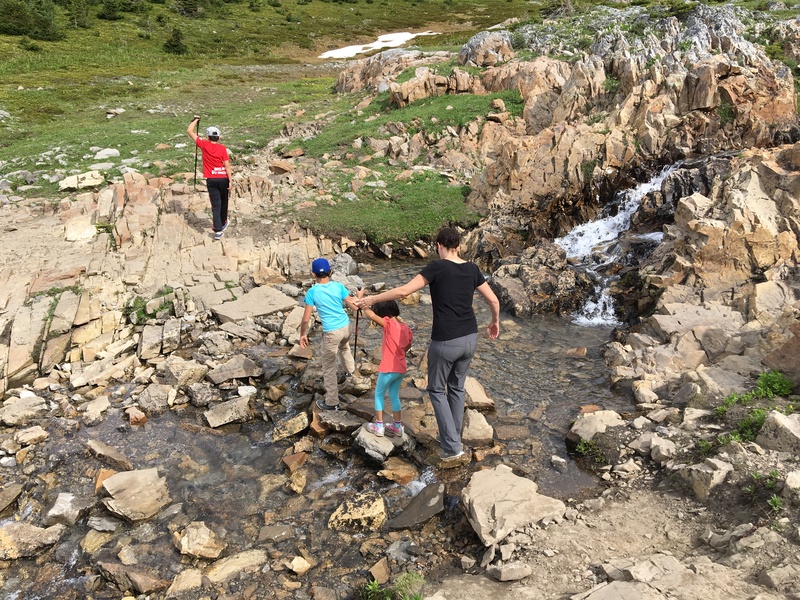 Ptarmigan Cirque is definitely in my top 3 in terms of best hikes to do with kids (Grassi Lakes and Bear’s Hump would be the other 2 on that list). There’s a bare minimum of uphill slog followed by amazing alpine views, fields of wild flowers and kid-sized adventures with rock-hopping, marmot-spotting and easy stream crossings. There are also some very nicely maintained pit toilets at the parking area – a major factor in the enjoyment of any hike with kids. 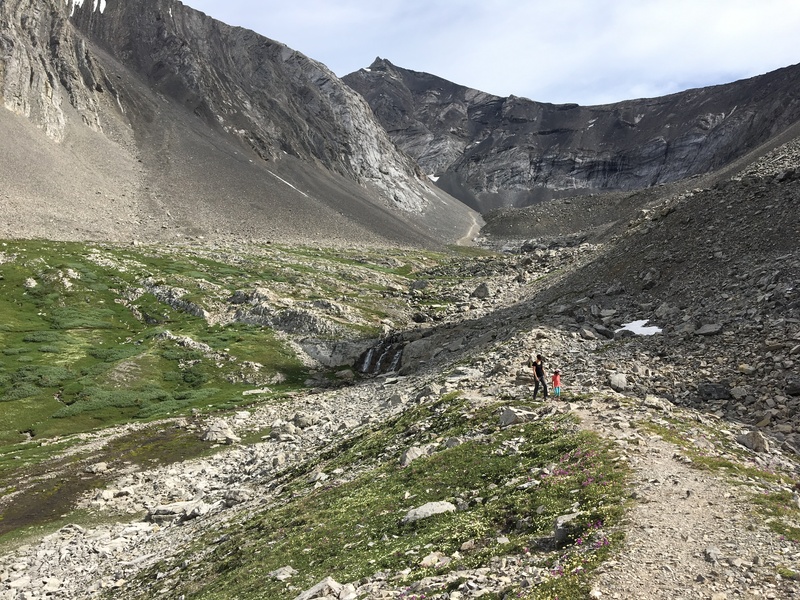 Ptarmigan Cirque is located in Kananaskis Country, and the trail begins at the Highwood Pass. 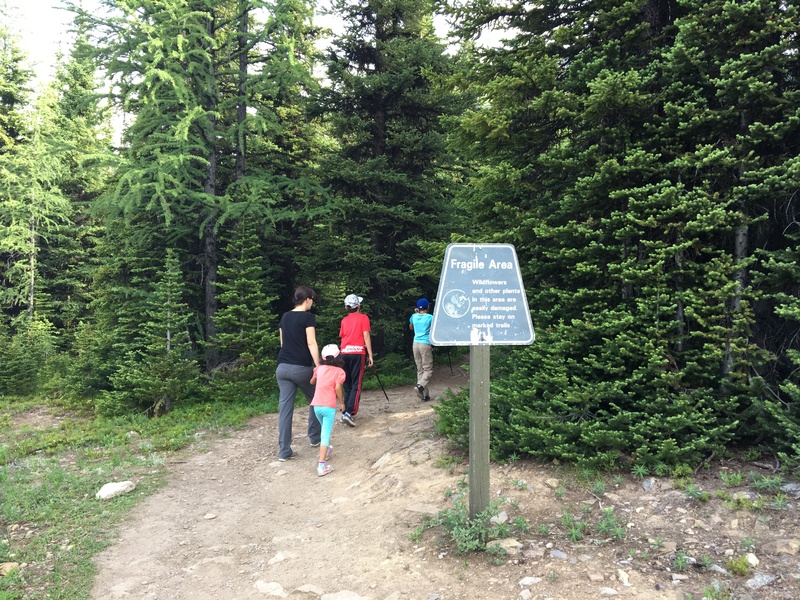 At 2206 m, it’s the highest point in Canada accessible by highway. There’s literally no way you could drive your car higher up a mountain in Canada to get you started on a hike. Get there on Highway 40, 67 km south from the Trans-Canada Highway junction, or 38 km north from Highwood Junction. The pass itself has a prominent sign marking the high point. 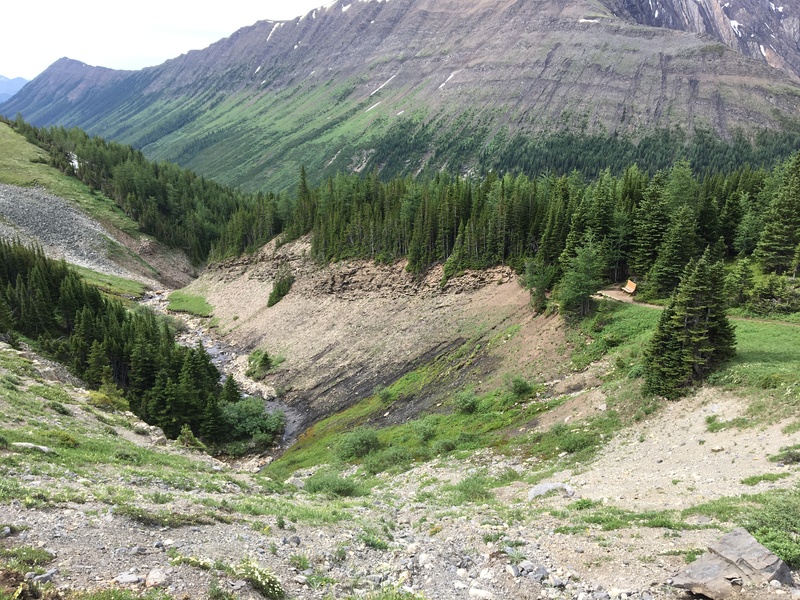 There are very clear signs pointing to the Ptarmigan Cirque hike, which begins at the Highwood Pass Day Use Area. Be aware that this part of Highway 40 is closed between December 1 and June 15. As an aside, if you’ve never driven Highway 40, you should. The views are astounding. Once you’re ready to start, the trail takes you along the highway a short way to a marked crosswalk allowing you to get on the proper (east) side of the the road. Thereafter, you’re starting your climb through cool pine forest. The trail is marked occasionally with numbered “stops”. These suggest the existence of some sort of interpretive brochure, but I didn’t see any at the trailhead. In any event, they function as a good way of marking rest stops for when little legs start to get tired. In 30 minutes or less, you pass an intersection, with a “Do not enter” sign on the right branch. This is where you’ll return after a clockwise loop of the cirque. Very soon after, you’re out of the forest and the cirque lies before you, Mount Rae and Mount Arethusa looking down from either side. 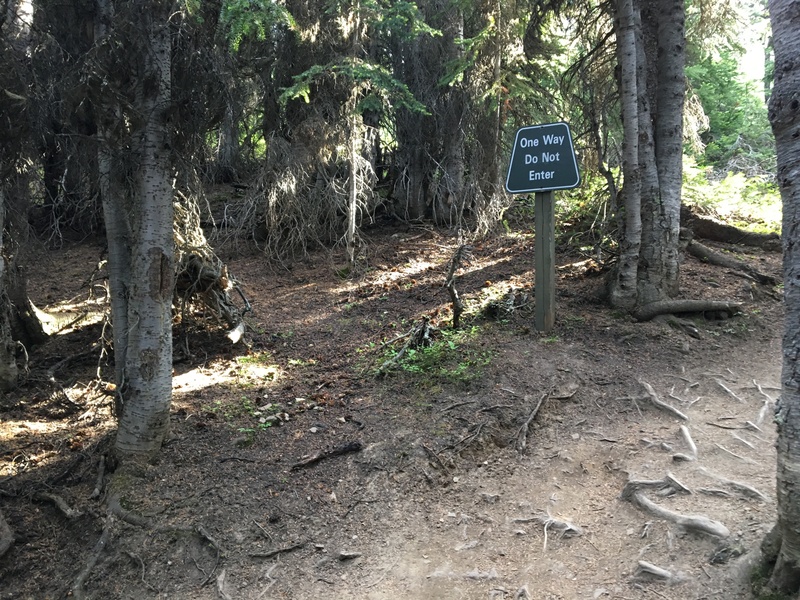 Proceed along the trail as it makes a clockwise loop. 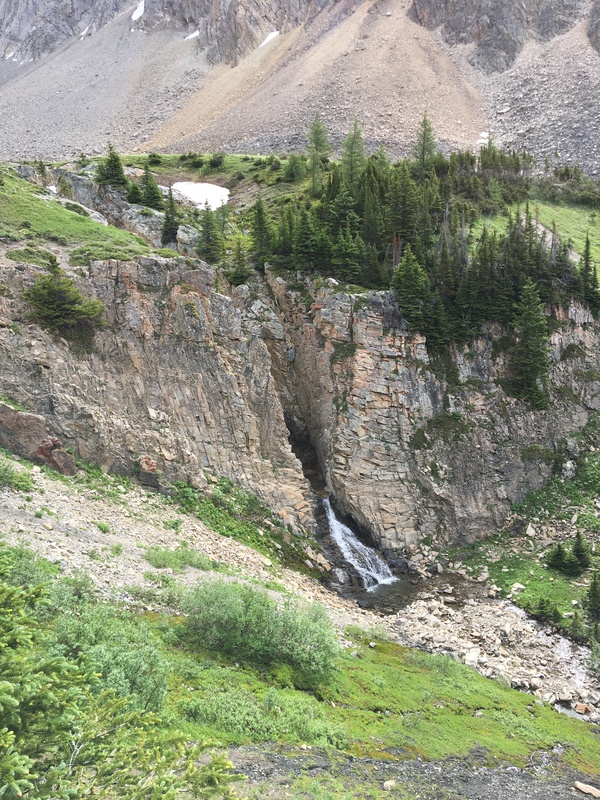 At the apex, you’re on a rocky outcrop next to a little creek and waterfall. There’s an option here to break from the loop and explore further up toward the northeast, following the creek through easy, rocky terrain to a waterfall. 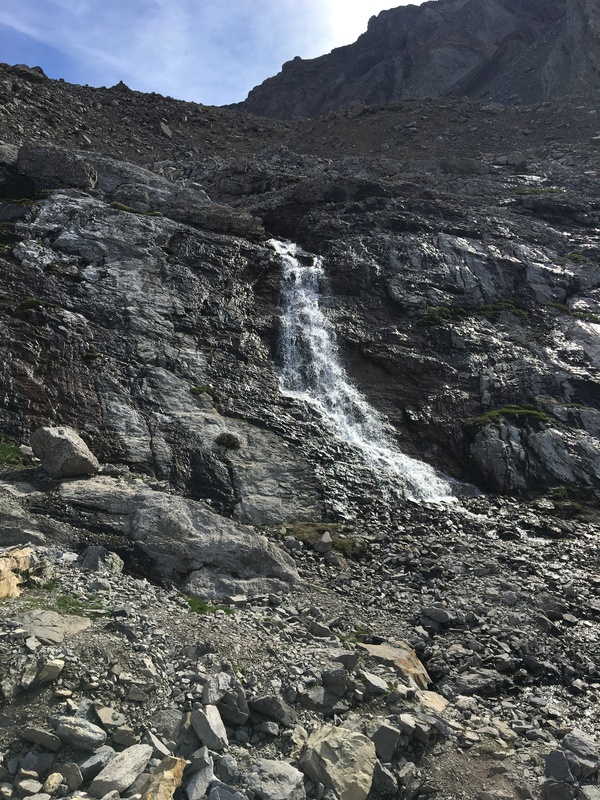 We made the waterfall our final destination, but there’s a trail that continues beyond and climbs the scree. This is the start of the Mount Rae scramble route. 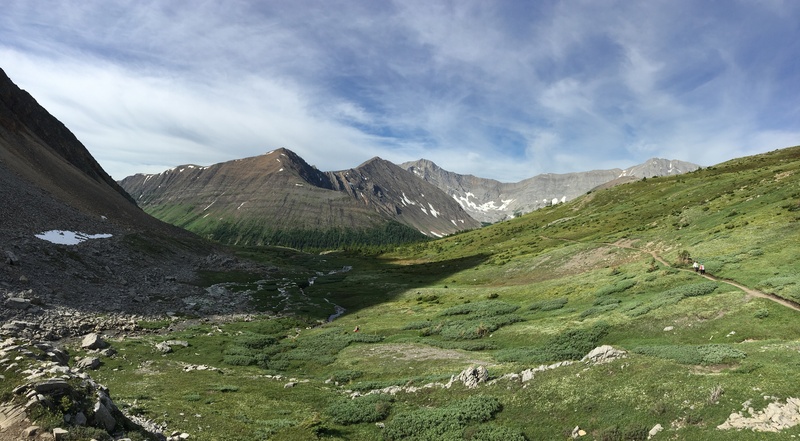 The way back has its own charm, with views across the valley to the Highwood Ridge and Mount Pocaterra. There’s another creek crossing before you re-enter the woods. Look for a bench at this point, a natural spot for snacks and pep-talks for any little hikers that are getting tired. The view from the bench shows the canyon that’s being ground out of the rock by the little stream you’ve just crossed. 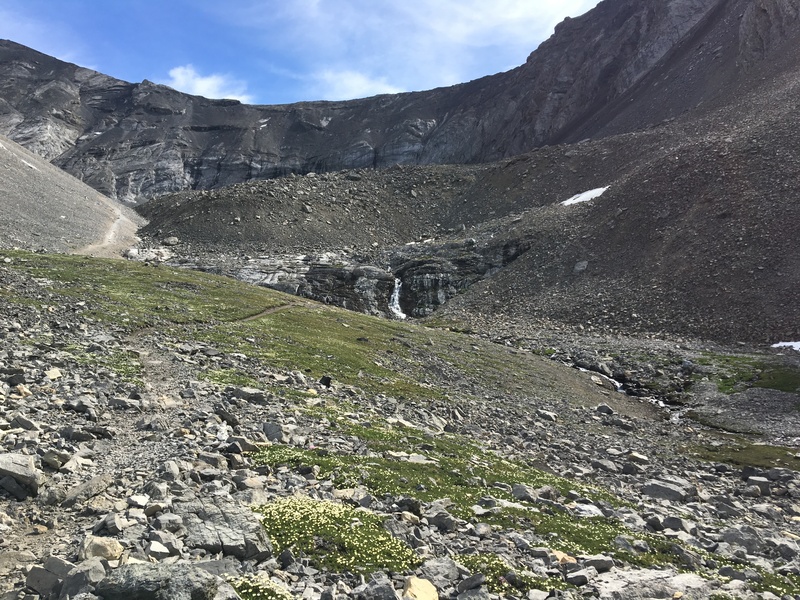 The hike is 2.3km from the parking lot to the top of the loop in the cirque. Elevation gain to that point is about 210m. 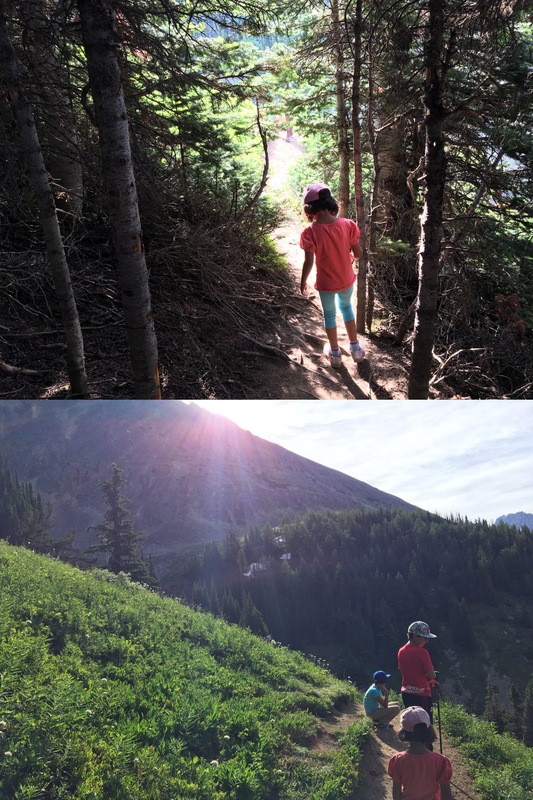 Our family did the hike in 2h21m including plenty of rests and lots of time exploring beyond the top of the loop. Click on the pictures in the gallery below to access full size images. 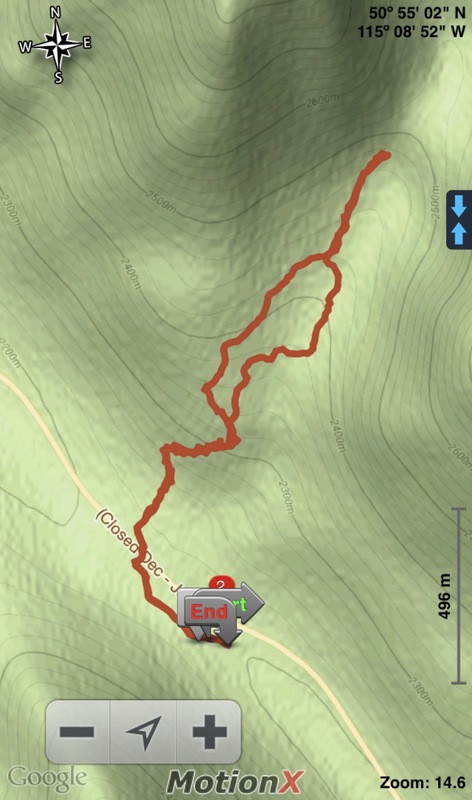 An overview of the route, including our excursion beyond the top of the loop trail. Once you’re across the highway, the trail plunges into the forest. The trail starts to switchback through the woods. At one point there’s a small side-trail that leads to a viewpoint. When you see this sign, you’re almost out of the trees. The trail gets quite busy. We came in the early morning and it was worth it to avoid the rush. Soon after, you’re up and out of the trees and the views open up. At the top of the loop through the cirque, this trail heads off towards the northeast. There’s a waterfall a short distance beyond that is a worthwhile destination. Looking back the way you came, from the top of the loop through the cirque. We went up to the waterfall and stopped. Off to the left, the trail continues to some real adventure – the scramble up Mount Rae. 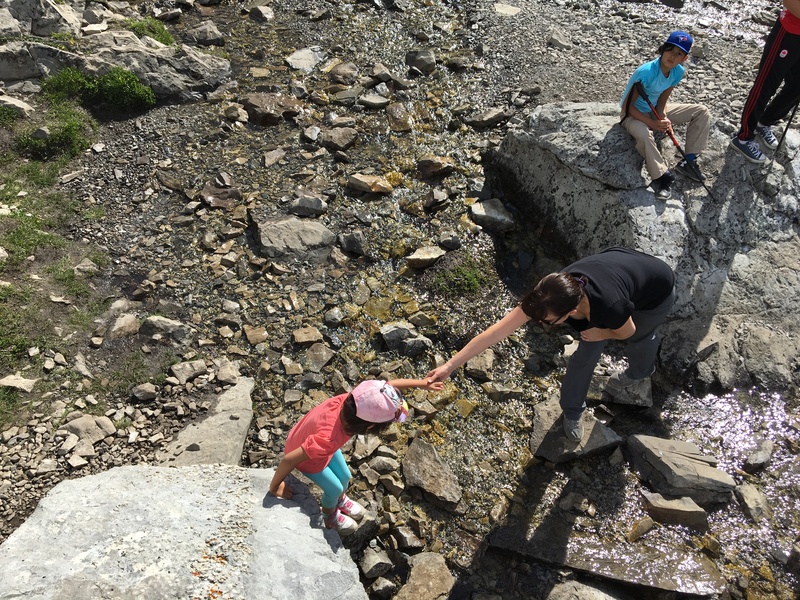 Stream crossings provide some perfect kid-sized adventures. Looking back as we begin our return trip. A second stream crossing, just before returning to the forest. You’ll soon see this bench, perched at the edge of the trees. The view from the bench, showing the little creek working hard to gouge out a canyon. 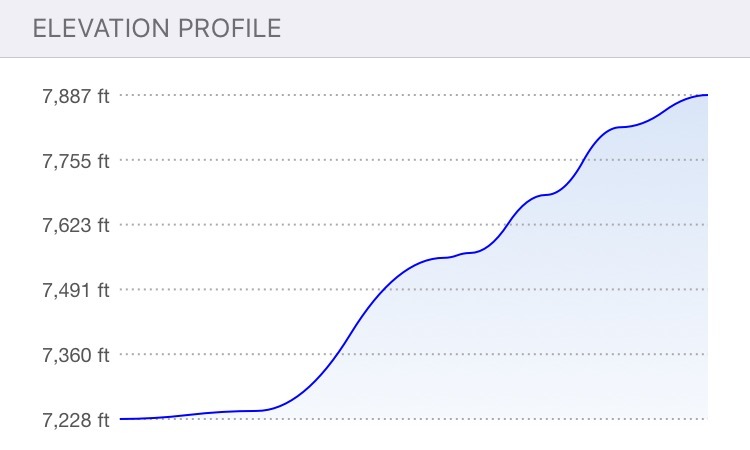 The elevation profile from the parking lot to the top of the loop through the cirque. The mountains are calling. . .